My friend and I decided to take the subway to the Bronx and then walk to Arthur Avenue. 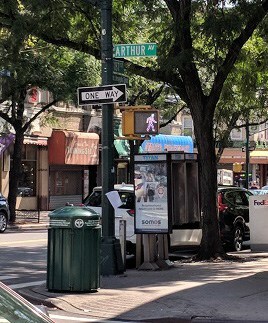 Arthur Avenue is the “other” Italian section in NYC and the last time we were in New York, someone told us it was too dangerous to go to the Bronx. This time we were determined to go. We took the subway for the long ride to the Bronx and exited at Fordham Station. It was a quiet Thursday morning and we began our 1/2 mile walk to Arthur Ave. Along the way we went through different ethnic neighborhoods which seemed worlds apart from Manhattan. We asked the traffic controller and mail carrier if we were on the right track and they reassured us Arthur Ave was straight ahead. Once we got closer to the area, we immediately spotted Italian bakeries, restaurants and the indoor Market Place. 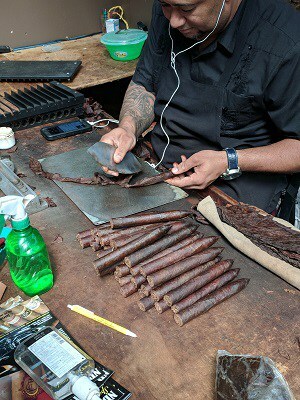 The individual vendors in the Market Place had cigars being made by friendly people, bags of pasta, and hanging prosciutto hams. Since it was time for lunch, we sat on wooden benches at Mike’s Deli and tried to decide what to order from the delicious sounding menu. The deli has been in business over 50 years and featured on the Food Network. The sandwiches we picked were stuffed with meats and cheeses on crusty bread. And the rice balls seemed too good to pass up. 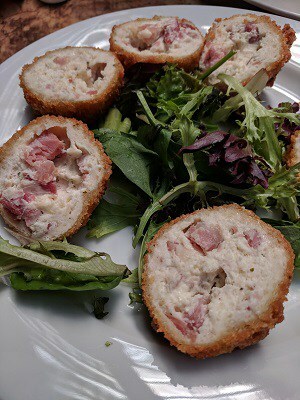 Each ball was lightly fried and halved to reveal the delicate inside. 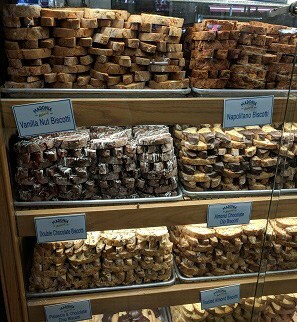 On our way back to the subway, I ducked into a bakery which specializes in breads and cookies. I bought the most delicious pistachio biscotti’s to bring home. As I had my morning coffee and dipped in a biscotti, I reflected over my adventures and new discoveries in the “Big Apple”.